Coming out of a decade of civil war, Liberia is struggling to find its footing again. Nowhere is this more evident than its capital, Monrovia. Founded in 1817 as a colony for emancipated African-American slave, the city is both the financial heart of Liberia and an important port on the West African coast. 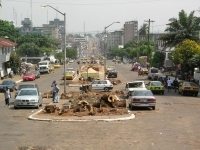 The centre of Monrovia is a typical tropical city. Its wide streets are lined with palm trees and informal merchants, and paint-chipped buildings make up most of the sights. There are a few attractions worth seeing, including the Waterside Market, the oldest Masonic Lodge in Africa, the National Museum of Liberia, and the Centennial Pavilion, which gives a sense of how much respect Liberians have for their history. One of Monrovia's top attractions is located about 90 minutes from the city: Monkey Island had a sinister beginning, founded as a lab to conduct medical experiments on chimpanzees. However, the experiments have long since ceased and the chimps are now cared for. 'Monkey Island' is a bit of a misnomer, as the facility is set on six small islands. Visitors who make an appointment can ride with the caretakers and interact with the chimpanzees. There are also plenty of beaches around Monrovia, most notably ELWA Beach near the airport, Thinkers Beach, and Ce Ce Beach. Facilities are spotty however, and swimmers should get local advice on where the safest areas are as the ocean can be dangerous. Tourism in Monrovia is on the rise, thanks in part to cruise ship traffic, and infrastructure is gradually improving. A good, if limited, selection of restaurants and bars pepper the downtown area, and the locals are generally friendly and welcoming to all visitors. Please note that the Ebola outbreak, which peaked in late 2014, caused chaos in Monrovia. While there were confirmed cases in both January and March of 2016, the WHO officially declared Liberia Ebola transmission free on 9 June 2016, and the FCO no longer advise against all but essential travel to Liberia. Travellers are still advised to familiarise themselves with the current health and travel advice for Liberia before travelling to Monrovia.